Uh hello! 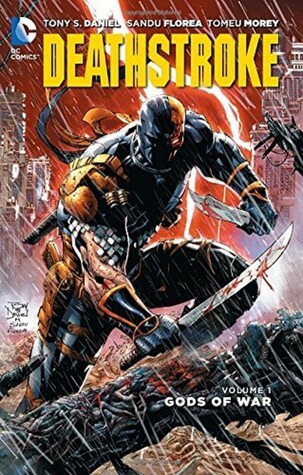 It's Deathstroke, need I say more. Our favorite assassin / anti-hero is off to kill someone who probably deserves it, when things go south. Now he's been turned from an old man into a young man [he knows because he hand to check down his undies to be sure] and going after his father, who has come back to life to enslave humanity. We have a lot of killing and appearances by Rose Wilson, Harley Quinn, Jericho and because we have a little trip to Gotham, the Dark Knight, Batman of course. Heavy on appearances and bloodshed this book is packed with action. The art of course is so incredible, such high detail and the coloring was beyond belief; such perfect combinations of light and dark, of bold and soft.